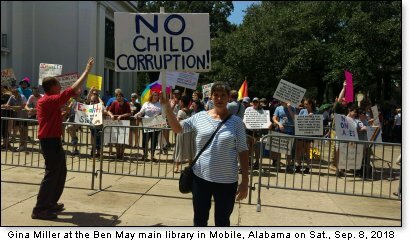 Last Saturday, I was part of a protest against a "Drag Queen Story Hour" being held at a public library in Mobile, Alabama. These events, which are happening in libraries and public schools all across the nation, are one of the newer weapons in the homofascist arsenal, and they target little children from three to eight years old. The events are grotesque spectacles of men dressed garishly as "women" reading "children's" books (that include feminist, homosexual and "transgender" themed stories) to little ones whose parents foolishly choose to bring them. A December 2016 column by a writer for the DailyWire reports that the "Drag Queen Story Hours" were spawned by homosexual and feminist groups in New York and San Francisco, in response to Donald Trump's election in 2016. At Saturday's protest, those of us who stood against this demented abuse of children were greatly outnumbered, when we shouldn't have been. The militant homosexual activists aggressively worked to make sure they had a large, boisterous presence, even bussing in a group of "free hugs" t-shirt-wearing millennials. Our side was basically one local TEA Party group that had encouraged right-minded people to attend. I'm guessing we had around 50 to the other side's 200 or more. It was a shame that more rational people were not willing to leave their comfort zone and stand outside that library to plead for the protection of little children, the most precious and vulnerable among us. The message that is sent to the world when we do not speak and stand against this wickedness is that we either don't care about the issue, or we approve of it. And even though our numbers are dwindling, as communist public school indoctrination continues on the younger generations, I know that there are still more of us than those who embrace this vile sexual deviancy. It may be that some people don't object to "Drag Queen Story Hour" because they have been deceived by the militant homosexual activists' propaganda campaign, which really got an aggressive boost under Barack Obama's regime. Its messaging seeks to normalize perversion, especially in the minds of school children and college kids. The deceptions they use to sell their depraved, dangerous behavior include calling it "love" (no, it's lust), claiming it is "equality" they desire (we're all already equal under the law), and falsely labeling as "hate" the truth we tell about the corrupt, deadly reality of homosexual and "transgender" behaviors. Another false argument they make is that "drag queens" must be allowed to do this, because it's a First Amendment issue. It is not! It's a child corruption issue, and we have plenty of laws against harming children. It doesn't matter to me if no one in the world can understand the fact that perverts dressed as "women" reading homosexual propaganda stories to little children is harmful to them. It remains harmful. None of what I say will make sense to anyone who rejects God's inexorable law. To those who embrace it, what I say is plainly true. 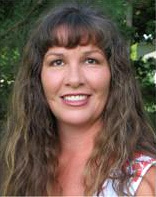 Homosexual and cross-dressing "transgender" behaviors are wrong. They have always been, and will always be, wrong. They are examples of aggressive rebellion against God and His proper design for mankind's sexuality. These bad behaviors lead to all sorts of misery for those who choose to engage in them, including inordinately high rates of suicide and suicide attempts, drug and alcohol abuse, domestic violence, mental illness, and disease. This is why it is an unspeakable outrage that these demonically-inspired people are targeting for corruption little children across our nation, and it is purely shameful that there is not a massive fight and push-back against it by right-minded Americans. If you could have been there last Saturday and watched as "parents" led their little ones into that library, past the cheering, pro-sodomite demonstrators, it would have broken your heart. We prayed for those precious babies and for the many deceived people who stood against us. We prayed the Lord would protect the hearts and minds of the children from the wicked influence of the transvestite reprobates who spoke and read to them. These "Drag Queen Story Hours" will continue across our nation, unless or until many, many more of us are willing to stand firmly against them in our cities.